An interview with the owners of Terrapin Beer Company, Athens, Georgia. 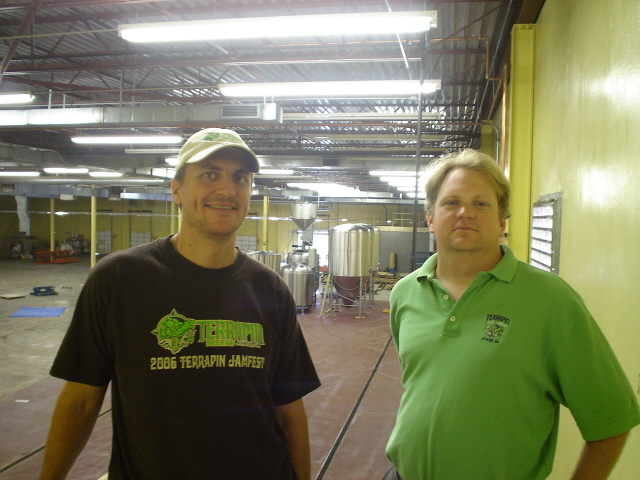 Terrapin brewery in August 2008. Flash Video Tour added in August of 2008. "The greatest achievement was for a time a dream. Dreams are the seedlings of realities." - James Allen, American author. Almost every beer lover in Athens is familiar with the fine products from Terrapin Beer Company, but many are unaware that Terrapin pays other breweries to produce their beers in a process known as "contract brewing." The bottled beers roll off an assembly line at Flying Dog Brewery in Maryland and the draft kegs are produced at the Zuma Brewery in Atlanta. However, this is all about to change. Early this year Terrapin co-owners, John Cochran and Brian "Spike" Buckowski, signed a deal to lease and renovate a 45,000 square feet Athens warehouse and the surrounding acreage located at 255 Newton Bridge Road. John and Spike are in the process of installing floor drains, plumbing, electrical components, brewing equipment, a tasting room and office space for their brand new Terrapin brewing facility. 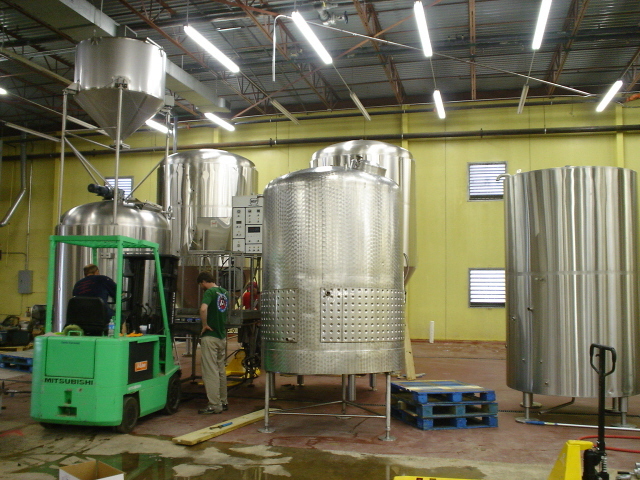 strike a pose in the new brewhouse in 2007. Spike commented, "John and I have put so much time, effort and hard work into Terrapin -- it's exciting to finally see brick, mortar and substance with a brewery building. It was flattering even without a brewery when so many people came up to us and expressed how much they loved our beer, but I felt that we couldn't give these Terrapin fans everything we had to offer because we didn't have a brewery home." John Cochran has been dreaming of producing a wide range of beers from his own brewery well before Terrapin began to contract brew and sell beer in 2002. "For those of you who think we have made some good beers in the past, just wait until you see what Spike can do with his own brewery. We already have plans for several new beers," said John. John and Spike met in 1998 when they both held jobs at Atlanta Brewing Company. Their mutual love of great beer sealed their friendship, and soon they were discussing the outlandish (and expensive) notion of opening a brewery. 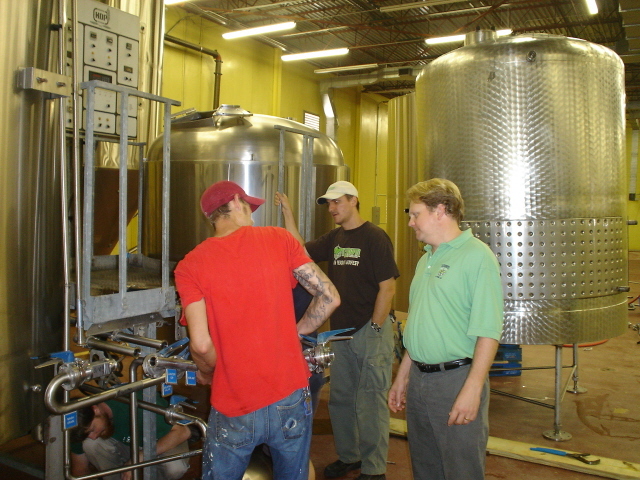 Spike moved on to the assistant brewer position at Atlanta's 5 Seasons Brewing Company in 2000, while John sought sales experience with a Georgia wholesale beer distributor. They both realized in early 2002 that contract brewing was perhaps the most realistic and affordable way to start selling Spike's fantastic beer formulations, and Terrapin's popular Rye Pale Ale soon made its debut at the 2002 Classic City Brew Fest in Athens. The beer was an instant hit among Athens beer aficionados and even stunned the entire nation by winning the gold medal for best American Pale Ale at the 2003 Great American Beer Festival in Denver. Terrapin Beer Company was now on the map. Rye Pale Ale is an aromatic, spicy, dry, slightly bitter pale ale made with a portion of malted rye for smoothness. Terrapin's other beers include Rye Squared (Rye Pale Ale with twice the malt and hops), Golden Ale (their lightest offering), Big Hoppy Monster (strong red ale), All American Imperial Pilsner (rich golden lager) and Wake-n-Bake Coffee Oatmeal Imperial Stout (intense black ale made with Jittery Joe's coffee). A potent, hoppy India Brown Ale is a new offering, and Terrapin also has plans to age portions of their brews in a variety of wooden barrels for limited release. John Cochran has a message for anyone in Athens who has never tried a Terrapin product. "We have a broad range of styles -- a beer for every palate. Our golden ale appeals to people who usually drink domestic lagers. The Rye Pale Ale is a very hoppy beer but it has a clean finish and a broad appeal. Freshness is also very important for beer. Once we have the brewery up and running, Athenians will be drinking extraordinarily fresh Terrapin products." Why have the Terrapin guys been so obsessed with locating their brewery in Athens? John Cochran was born in Commerce, attended UGA and has always considered Athens his home. Spike lived in Atlanta but quickly fell in love with the atmosphere and people of Athens. "It was interesting to drive out of Atlanta and as soon as I got into Athens, it was like a big weight was lifted and I felt at home. We wouldn't have put Athens on the Terrapin labels if we hadn't planned on being here from day one. We had many opportunities to establish the brewery outside of Athens in cheaper warehouses, but that just wasn't an option for us," commented Spike. Terrapin hopes that the new brewing facility will be fully functional by the end of the year and that the people of Athens will come out for a visit. Tours and tastings will take place once or twice a week, and larger events and celebrations (such as the company's April birthday party) will be included throughout the year. The brewery will house an inviting tasting room, and a landscaper is coming up with plans to make the grounds a pleasant place for outdoor events and music from local bands. Because of the many unique, promotional events they sponsor in town, the Terrapin owners are well known around Athens. Pub-crawls, tastings, pint nights and premier parties for their new beers are all a part of the regular routine for John and Spike. A Terrapin bake-off was even organized in which customers could enter homemade desserts made with different beers. John approaches Terrapin fans from a certain point of view. "These people enjoy our beers and understand what we are trying to accomplish, and it's always enjoyable to interact to them. They show up for our beer -- how could we not be flattered by that?" Terrapin would like to thank the people of Athens for their devotion and patience. Spike summed it up by saying, "It took us five years to get our Athens brewery location. Anyone could have given up on us by now, but Athens understands what we are trying to do with Terrapin and how we value our roots here. We now have a place to call home and we will truly be a part of the Athens community. It can only get better from here." Terrapin Beer Company co-owners, John Cochran and Brian "Spike" Buckowski, have dreamed of opening their very own brewery in Athens, Georgia since they began contract brewing five years ago. This dream is currently taking shape in the form of a 45,000 square-foot warehouse located at 265 Newton Bridge Road in Athens. Terrapin's most popular product is their crisp and flavorful Rye Pale Ale that grabbed a gold medal for best pale ale in the country at the 2002 Great American Beer Festival. The company's portfolio also includes the malty Golden Ale, Rye Squared (an imperial version of the pale ale), Wake-n-Bake Coffee Oatmeal Imperial Stout, Big Hoppy Monster strong red ale, All American Imperial Pilsner and the new hop-filled India Brown Ale. Production of all these fine beers is currently being shifted to the new Terrapin brewery in Athens, and John, Spike and the entire Terrapin team are working long hours to put the finishing touches on the brewhouse, tasting room and office areas. Their enthusiasm and excitement are quite apparent in the following interview that took place just before the brewing equipment arrived at their new facility. OWEN: What has been the most challenging part of getting the new brewery going? SPIKE: It's pretty tough to raise money for a brewery if you don't already have a brewery. To make things worse, when we started looking for capital in the late 90s, the craft brewing industry was experiencing a decline. JOHN: When we started, we put together a business plan and came up with the idea to open a brewery. We were two brewers with maybe three years experience each and no track record. We were telling people to trust us and give us a million dollars -- we can make great beer. That didn't work out too well. OWEN: What's been the most exciting part of getting the new brewery going? SPIKE: We've put so much time, effort and hard work into this company, it's gratifying to finally see things happen and the actual building take shape. Before we just had a product, now we have a home. Even with contract brewing our beers, Terrapin has generated a big fan base, but it's really important to us that Terrapin has a brewery home. I can give our customers great beer, but we wanted the whole package. People will now be able to put a face with a name and a building with our beer. JOHN: Later this year when we are open and doing tours and making the beers there, that will be the exciting part for me. OWEN: Why did you stick with Athens when other locations popped up in the past? JOHN: We love Athens. I was born in Commerce and went to school at the University of Georgia. It's an amazing town, and I know Spike enjoys it here. SPIKE: There was never a question -- since day one we were going to be in Athens come hell or high water. When we first started, John and I would go out every Friday night and we would walk into places to talk to people and have a beer. I lived in Atlanta but always loved coming to Athens -- it has a totally different mood and feeling for me -- Athens is where we want to be. We had a few chances to establish a brewery in less expensive facilities in other cities, but we never really saw that as an alternative. OWEN: How did you decide on the name for Terrapin? JOHN: I was throwing around some pretty awful names for the company near the beginning, and one day Spike just came up the name Terrapin Beer Company. Spike was a big Grateful Dead fan in college and followed the band around and was thinking of the album Terrapin Station. SPIKE: We are kind of like a turtle -- slow, steady, and rock solid. And it’s a Terrapin -- people like turtles. OWEN: What makes Terrapin so special? Why do beer lovers in the region like Terrapin so much? 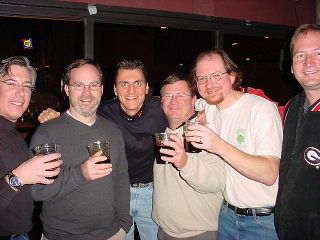 JOHN: When we introduced the Rye Pale Ale at the 2002 Classic City Brew Fest, we knew that we loved the beer, but it was really good to see how much everyone else enjoyed the beer too. SPIKE: It's a solid product. Some people will tell you that you can put sub-standard beer in a bottle, and as long as it has a flashy label it will sell. I disagree. People may try a bad beer once, but they probably won't buy it again. We put the best beer we possibly could in the best package we possibly could and we hit a home run. JOHN: Remember that in the first couple of years we were draft-only -- we didn't even have any packaging. All we had was the turtle logo and the great beer. OWEN: What's the story behind your bottle labels? SPIKE: Our really cool labels are drawn by Richard Biffle from Virginia Beach. I visited his art booth one year at the Bonnaroo music festival and recognized some of his Grateful Dead album covers. We already had some sample artwork for our labels that we really didn't like. I introduced myself to Richard and he agreed to do our labels. I don't think we could have made a better choice. OWEN: What sold you on the location for the brewery? JOHN: I've seen the building for a year and a half or so, and we realized that it would work really well for Terrapin. The building is 45,000 square feet, and many construction people in town have told us that it's one of the most solid buildings in Athens. It also comes with a couple of acres of land, and we've been talking to a landscaper about what we can do to the grounds. The building and grounds need to look like a home for Terrapin and reflect our personality. OWEN: How would you like to handle tours and events at the brewery? JOHN: We will probably do one or two tours a week to let people see the place and try the beers in the tasting room. Once or twice a year (especially on our anniversary) we'd like to also do some big events at the brewery. SPIKE: There will also be music. There are great local bands in Athens who want to play our brewery. OWEN: What advice would you give to a curious beer drinker who has never tried a Terrapin product? SPIKE: Try the broad range of Terrapin beers. We have such a big array of beers that there is really one for every set of taste buds. JOHN: Freshness is also important. We'll be cranking out some extremely fresh beer from the Athens brewery. Drinking local beers, supporting the local community and breweries is a good thing. We're big supporters of all craft breweries, and we'd like to see another 10-20 breweries in Georgia. Every craft brewery has a different flavor and style, and it's amazing how many different beers are out there. We want people to try them all. SPIKE: Craft beer drinkers really like to try a wide range of beers. Bud or Miller drinkers usually just drink one type of beer until they die, but craft beer lovers are more open-minded when it comes to beer. JOHN: Even Spike and I don't just drink Terrapin. We'll walk into a bar and people will ask us what type of Terrapin we want. They are amazed when we want to try other craft beers and imports, but we love beer and enjoy sampling new products. SPIKE: If we don't evolve our palates, then how can we expand our brands? It's also important to try beers with flaws, learn about how the flaws come about and prevent these flaws from ever happening in our beers. OWEN: What are the big plans for your beers once the brewery is up and running? JOHN: One of our main goals is to educate the public about different beer styles. That's hard to do when you are contract brewing. We'd like to make several different styles throughout the year. I think people can look forward to seeing a lot of different beers from our new brewery, and our planned barrel-aged series is going to be very impressive. SPIKE: John Maier is my ultimate beer idol. This guy has brewed over 60 different styles of beer at Rogue, and I think he is one of the top brewers on the planet. I enjoy what he does and would like to emulate that and just put out a lot of different beers. OWEN: What makes Spike and his beers so popular with crowds? JOHN: This guy is talented and creative, and I think one day he is going to become a famous brewer. There is a technical side and a creative side to brewing, and Spike has mastered both. OWEN: Why does Terrapin organize so many small, unique events around the area? JOHN: We like meeting beer fans. These people like what we are doing, and it's enjoyable to talk to them one-on-one. They show up for our beer -- how could we not be flattered by that? OWEN: What are your goals for Terrapin over the next ten years? JOHN: We've never wanted to be a large national brewery. I think we are going to be in the Southeast and maybe the mid-Atlantic states in the next ten years. We want to be a regional brewery, and that's as far as we plan on taking it. We will grow the markets we're in and offer new beers here and try to be a great, local, regional brewery. SPIKE: We always want to be a part of Athens -- this is our town, and the people here are what we are about. The hometown people in Athens will benefit from the special, small batches that we will be doing. These beers won't be going too far from Athens. JOHN: Spike and I would like to thank the people of Athens. When we started this dream a little over five years ago we always said that one day we would be opening a brewery in Athens. Never has anyone in Athens claimed that we're just a contract brewery and not really a part of the town -- people have been very supportive. Everyone's very excited that Athens will soon be home to the new Terrapin brewery, and we'd like to thank our customers for being patient and sticking with us.